Since the inception of Buzz Around, we have prided ourselves on providing our clients with service and reliability they can depend on. This has meant that as a result we have formed important links with our existing client base, who have also gladly recommended us to other new clients. Buzz Around aims to offer a professional service, which means that all our drivers have the appropriate accreditation, offering you peace of mind. All our drivers have Public Drivers Permits (PDP’s) and our vehicles all have the appropriate road permits and roadworthy certificates. Our vehicles are serviced regularly, and all vehicles have a full service history. Buzz Around also has full passenger liability insurance. Please contact us should you require any further information. 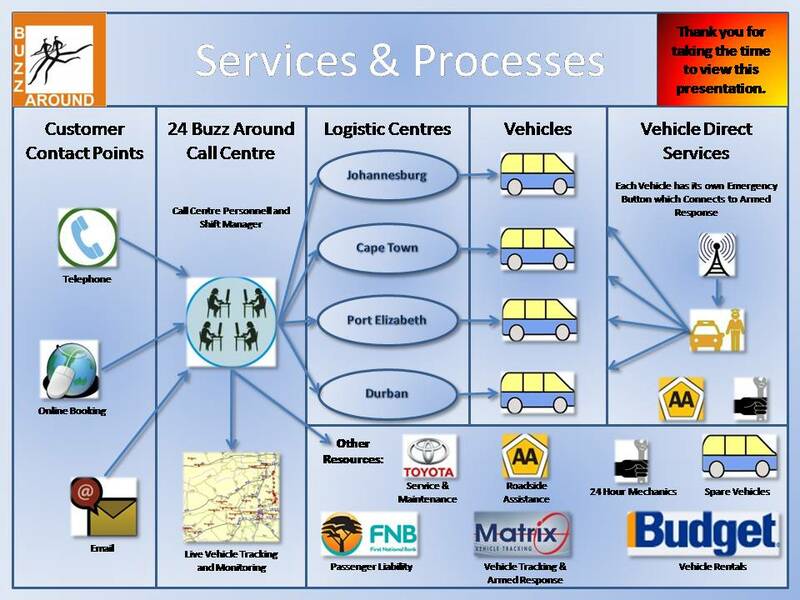 Buzz Around has also been accredited as a Bonded SATSA member, which now offers our clients additional peace of mind. As part of our commitment in delivering excellent service to our clients, we operate a 24 hour operations centre, which monitors bookings, transfers, drivers, flights and vehicles through live satellite tracking on a 24/7 basis. Our operations team has been specially trained to deal with any eventuality, and are here to ensure that all our passengers have an excellent experience with Buzz Around. Should you have any after hours queries, please do not hesitate to contact our operations team. Our state of the art booking system manages your booking from the time of booking all the way through to completion and follow-up feedback at the end of the booking. Bookings can either be requested through our online quote request system, or an e-mail can be sent to info@buzzaround.co.za – we prefer all bookings to be completed in writing to avoid any confusion. Once you have accepted and confirmed the quotation for the transfer, you will receive a booking confirmation, with a unique booking number, also known as the “BN” number. The booking confirmation will contain all the relevant information for the transfer, including the passenger’s name, contact details, pick-up and drop-off points. The day before the transfer we will schedule a vehicle and driver for the transfer, as well as an SMS (SA cell phone numbers only) will be sent to the passenger, confirming the pick-up time and point. The day after a transfer, all our passengers receive another SMS requesting them to rate our service, as we are always looking for ways to improve our service. Ensuring vehicles are in a good roadworthy condition. Ensuring that all our passengers are picked up on time, and if need be in the event of flight delays or early arrivals, to ensure that the passengers are picked up without delay. Dealing with after hours requests and bookings. All our drivers have not only been chosen for their driving skills, but just as importantly their ability to deliver excellent customer service, thus in turn making each passenger feel that he/she is a VIP! All our driver have Public Driving Permits (P.D.P’s). In order to qualify for a PDP each driver needs to have a medical exam with a doctor, eye test and have their fingerprints checked for criminal records before receiving their PDP. This process needs to be completed every two years. In the example on the right you will notice that the driver’s license has an extra block to state that the driver has a PDP and when it expires. All our drivers also undergo additional internal training on customer service skills, defensive driving skills, navigation, time keeping and basic first aid. We also have a rolling programme to send drivers on advanced driver training. Our drivers are dressed in black trousers, white shirt (logo on the collar), black tie, with a black pullover jersey with our company logo and/or a black jacket. Buzz Around offers a wide range of Passenger services from Airport Transfers, Tours, Conferencing and Motivational Transfers. Since our inception in April 2006, we have prided ourselves in providing our clients with service and reliability they can depend on. We are a registered member of SATSA, which offers our clients peace of mind & security. Our clients include individuals, visitors to South Africa and corporate clients such as FNB, Heineken, Standard Bank, Rennies Travel, Clover Danone and Investec, just to mention a few. We believe that YOU (the client) is the most important person in our business, so whatever your requirements are, please contact us, and we will gladly customise any package or service to meet your specific requirements. As our emphasis at Buzz Around is on people, it is our duty to give back to the people in our local community. As a result of this we support various projects. Our support of these projects plays an important role in our company and we make both financial and transport donations to these organisations, as we believe that a fundamental part of our business is uplifting others in our community. Each year we have the pleasure of transferring the toddlers from Nomalanga Day Care, which is based in an informal settlement in Soweto, to their annual Christmas Party, which was held on the other side of Soweto. The day care caters for 95 pre-school children, and all the children come from families where there is either no breadwinner, or there is one breadwinner, who is supporting not only the children in the family, but more often than not, also supporting their extended families. For us at Buzz Around, it gave us great pleasure in helping to transport the children, and also with Christmas gifts for each child. In our line of business, the pressure is always on us to make sure that we do not leave too large a footprint on the environment. We have committed to only using unleaded and low sulphur fuels. Our vehicles are also chosen based on their fuel consumption, in order to help minimize the impact which the fumes from fuel have on the environment. We are also involved in a project which takes our used tyres to create embankments which combat soil erosion, our old engine oils are also sent for recycling. We also ensure that all our vehicles are serviced regularly, in order to keep them from producing obnoxious fumes and are as fuel economical as possible. We are also in the process of exploring bio fuels and vehicles which use hybrid technology. We have also embarked on a recycling scheme, where we recycle office waste as well as empty plastic and glass bottles left behind in our vehicles.